I’m a rafael Nadal fan. However, the steady decline of Tennis legend, Roger Federer is irking me. The manner in which he lost today’s QF match against Tsonga ( 6-3, 7-6, 4-6, 4-6, 4-6 ) has suddenly made him appear a lesser mortal. I have never seen Federer loose a game from such a position of strength, I still can’t believe that he actually lost that match. I’m not an expert of Tennis however, I can clearly see his game has taken a beating, during his peak between 2004-08 his down the ground shots were like magic, they used to sizzle past the baseline. Now all that is gone, his backhand seems to have weakened and ball keeps flying away. Such a pity. Federer’s match-up against Nadal has always been lopsided so, when Rafa bamboozled Roger during the French Open, 2008 ( 6-1, 6-0, 6-3 ) final, the first signs of Roger’s decline surfaced but, the very next year Roger lifted his game. However, this time around the scene looks lot different, emergence of players like Djokovic , Murray and few others have hugely dented his chances of winning a Grand slam in future. It’s sad to see the decline of Roger but, all’s not over yet he’s a fighter and a Champion, I strongly believe he will surprise us before sun sets on him. It won’t be easy, at 30 all would agree that only few years of top class Tennis is left in him but we would love to see him win few more slams. cheers to Roger. well said, Narendra! It was disappointing to watch but like you said, he will surprise us with another grand slam. It will happen, and if it doesnt, he does have 16 grand slam wins to boast about. I am, and will always be a fan of the great Roger Federer! I would question his game today against Tsonga, but never his character as you say you don’t find him a good person. He has a charity, which helps children in Africa, for example. He raises money for his charity. It’s hard to judge a person’s character by just watching them on TV. He is that good to have captured the number 1 title for so long. I am not a fan of Djokovic but I would never trash-talk him in anyway. I didn’t trash-talk him, I said impression I have about him. I understand that you are fun of Roger but don’t exaggerate. They are all having charities or are involved in one or another way. I am not even fun of Djokovic, as his character doesn’t suit me as well. He was good in tennis once (and I didn’t like him then too) and he is not any more. Now there are better players I find more charismatic and more interesting to follow. Tsonga played well. 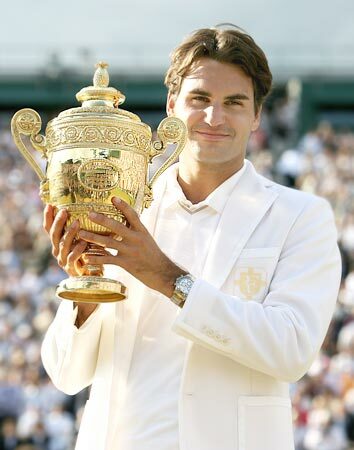 I think big Rog will quit when he wins one more….at the top… and he doesn’t need the stress.